With my Hagetaka project on hiatus (eventually being rebuilt using EX-106s), my efforts had been diverted to a simpler and more manageable design. Originally intended as a last minute work around for Robogames, this project ended up being a permanent effort, and one that I’ve grown rather fond of. Giger is a 24″ custom 24 DOF Humanoid using 16 RX-64 and 8 RX-28 Dynamixel Servos, weighing in at 9lbs total. He uses the same Gumstix based onboard controller that Hagetaka did, designed by Farrell Robotics, and is powered by two 1900mAh 4S LiPo batteries. Walking gait is being refined, I’ll have video in the near future but much progress has been made. If all goes well, I’ll have him up and running for iHobby 2009 next month! Here are a couple of pictures, for the full set that we took check out my gallery in the TRC! Phidgets have long been a favorite for computer software developers due to their ease of use, wide selection of sensors and I/O boards, and solid API offering for a variety of programming languages. The one thing that has always been a requirement however, is a physical connection to a computer via USB cable. All of that is a thing of the past now with the introduction of the PhidgetSBC; an Arm9 based embedded Linux computer (it runs a custom Linux Distro built using Buildroot) combined with the tried and true Phidgets 8/8/8 IO Board. So what does that mean to you? In its simplest form and function, it effectively cuts the cable of your Phidgets projects and allows you to access your Phidgets devices over ethernet or the included Wifi dongle. The onboard computer acts as a server for the variety of APIs that Phidgets offers, and this enhanced ‘mobility’ opens the doors to a much wider variety of applications. 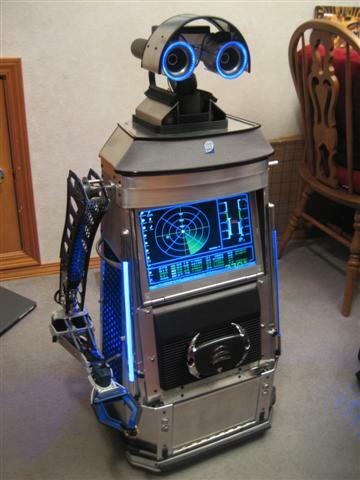 The PhidgetSBC can function as a wireless extension of your PC, a Wifi enabled Robot Controller, or even a standalone Robot Controller. That’s right, the PhidgetSBC is fully programmable; there is an easy to use interface that allows you to load custom C or Java code directly to the board and have it run autonomously, without the previously required PC link. If that wasn’t enough, more advanced users can modify the Linux build to their hearts content, host other USB based Phidgets devices by simply plugging them into the PhidgetSBC, and has integrated support for streaming a web cam feed back to your PC. I’m really just skimming the surface here, for more details check out the (as always) very well documented product manual. The PhidgetSBC will run you $243.90 USD and we are currently accepting pre-orders for this as we anticipate it to be a very high demand product. Given that the development kits for the onboard computer used here usually run in the ~$150-200 range, this price is a VERY good deal to anyone looking to take their Phidgets projects to the next level. Initial quantities will be limited and orders are filled on a first come first serve basis, so get your pre-order in ASAP to snag one up! 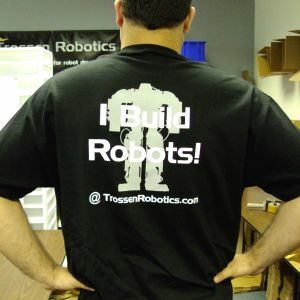 We’ve been asked for awhile to make the ‘I Build Robots!’ T-Shirts (we sport them at Robogames and various tradeshows) available for purchase. Well, we finally got off our lazy butts and made it happen. Our Fun Robot Stuff section is a bit barren right now, but we’ll be filling it with cool robot gear and merchandise in the near future. 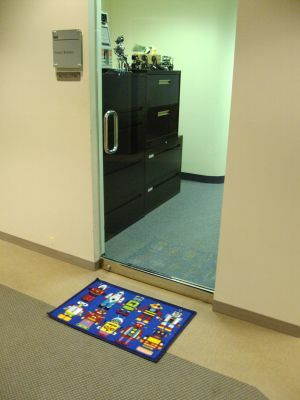 Did I mention we have Robot Floor Mats too? Very bright, very retro! Oh and ‘I Build Robots!’ stickers for good measure. This month’s Make Magazine (Issue 19) is the yearly Robotics Hobbyist special, and features my boss Matt Trossen once again stealing all of my glory and talking about his take on the current state of hobby robotics. That is okay however, and I’m prepared to take it with stride because anyone reading this blog knows I’m the true brains behind this operation. Not only that, but I’m also better looking (it’s the beard) and I embrace an air of dignity and modesty. Speaking of my dashing good looks and superior mental prowess; Make also featured my currently shelved and ego-crippling project Hagetaka. Rest assured; my wife and 2 year old have picked up 2nd jobs to fund this project further and it will return with even stronger servos and bigger guns, ready to assist me in my plan for world domin- err, winning Mech Warfare. 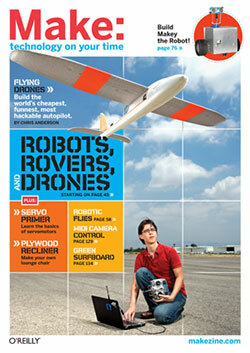 Last but not least, Make Magazine readers got a quick and to the point review of the Roboard, the first full featured Robotics Computer on the market. But seriously, be sure to pick up a copy as the entire issue is full of fun projects and robotic tidbits sure to appeal to your average robot-geek. And like Christmas, it only comes once a year! 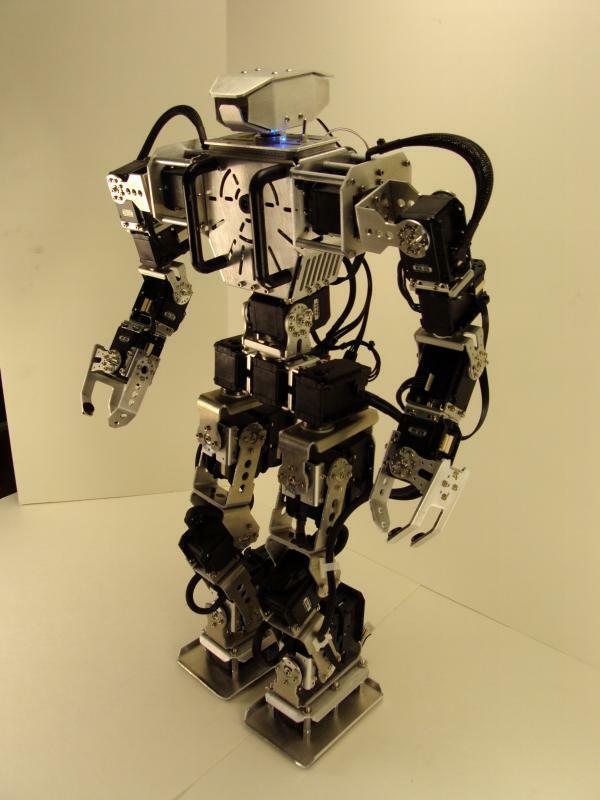 I’m not at all exaggerating; Loki, a 4 foot tall 40lb ‘Domestic Style’ robot looks far better than anything I have seen produced for commercial sales. Beautiful aesthetics aside, functionally it is one of the most impressive and polished PC based robots I’ve ever seen as well; custom software that handles object recognition, mapping and navigation, as well as voice commands, just to name a few. If all of that wasn’t impressive enough, creator Dave Shinsel has the schematics, documentation and even source code available on his site! Definitely check out Dave’s entire site, he has an impressive body of work, and his Youtube Page has some very cool videos demonstrating Loki in action. I mean, he didn’t even wash his hands. Robots are so insensitive to human mysophobia. Can You Smell What Lynxmotion Is Cooking? Our good friends over at Lynxmotion have been a force to be reckoned with for well over a decade in the robotics industry; producing some truly inspiring and amazing robots over the years. My first ‘real’ robot was a Lynxmotion Hexapod 1 (the 3 servo variety) that I picked up back in 1997, and their product lines were one of the driving forces that got me addicted to robotics. Well, they’ve impressed me yet again; Lynxmotion owner Jim and his son James, being robot enthusiasts and likewise fans of the Mechwarrior franchise, were intrigued with the Mech Warfare competition. Specifically they loved the biped aspect of it and so they set out to create a low cost competitive platform for Mech Warfare, and succeeded. Nicknamed ‘Hunchback’ and based around their BRAT biped platform, this is turning out to be one of the lowest cost and straight forward platforms for the competition. Currently there is a work-in-progress tutorial showing the build and code, and it looks like we have a very high chance of being treated to a complete kit allowing you to build your very own. If you’re interested in seeing how it progressed from prototype to near final revision, check out the project thread over on the Lynxmotion forums. Check out the following video of the Hunchback in action! We’re good friends with the folks over at Vanadium Labs; some very talented people who have been in the robotics game for quite awhile but have just now established their official company. This is great news for the robotics community however, as they have some pretty amazing products on the horizon. One product in particular is the new arbotiX Robocontroller, an advanced Open Source microcontroller tailored for the Bioloid system and AX-12+ servos. The arbotiX robocontroller is an advanced control solution for small-to-medium size robots. 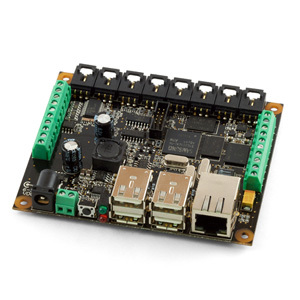 It incorporates a powerful AVR microcontroller, XBEE wireless radio, dual motor drivers, and 3-pin servo-style headers for IO. 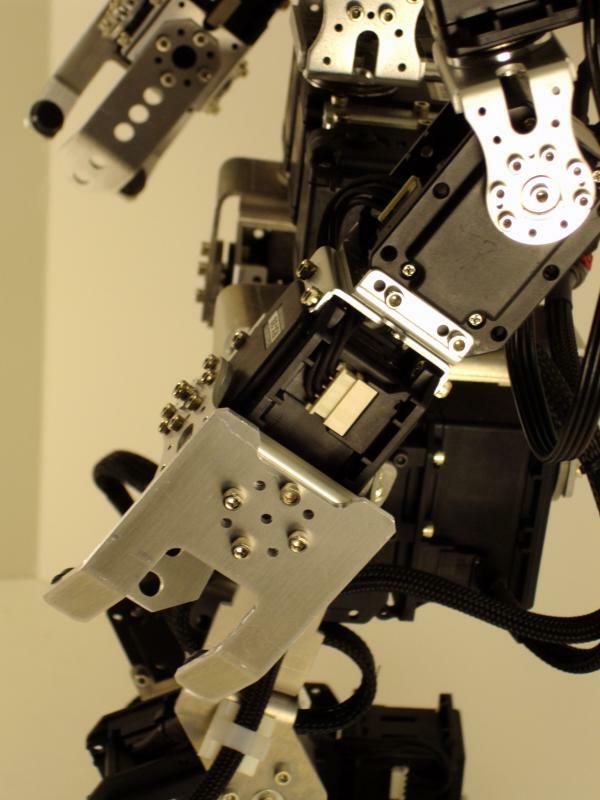 The arbotiX robocontroller is specifically designed to control robots built using Bioloid servos, although it is also a very high-end solution for powerful rovers. 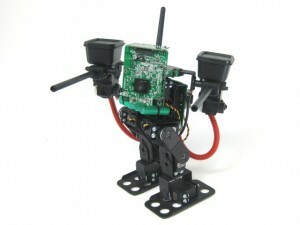 It is not intended to be a drop-in replacement for a CM-5, rather it is intended as a high level development tool for building more sophisticated robots. 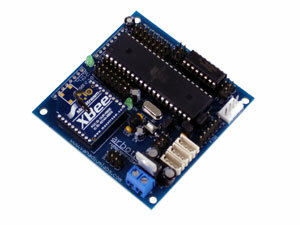 So what we have here is an Arduino IDE compatible microcontroller with a plethora of I/O, plug and play capable with AX-12 servos, and an Xbee Wireless Link to your PC. It’s also worth mentioning that this was the controller used in the robot that won Year 1 of Mech Warfare, Issydunyet. For more information on the controller check out the Vanadium Labs website. Trossen Robotics will be exclusively distributing this exciting and powerful new Robocontroller with an estimated release date of Mid-October 2009. We’ll have more details in the near future, stay tuned! Want to see the arbotiX in action? Here is a quick video showing a basic Inverse Kinematics demonstration on Issydunyet!